I don’t know about you people, but something in my knitting impulse had a major shift this past weekend. Maybe it’s my rebound from the knitting ennui talking, but suddenly a few days ago I started looking at my yarn stash, and all of a sudden, knitting socks (as I’ve been doing a lot of lately) was not good enough. We’re talking mitts, gloves, sweaters, scarves, here. Anything and everything to add layers of warmth because, um…winter is going to be here soon. Around here we’ve been granted a reprieve this week and the temps are still several degrees above zero, which means this is the perfect time to put in some time on the cold weather knits because I always end up in the trap of only knitting these things when I actually NEED them, which is of course far too late to start. Now, I don’t know if you’ve noticed, but there are one or two fingerless mitt patterns already out there. You may have already even knitted a pair or twelve as gifts, oh, right about this time of year in knitting seasons past. So when I got hooked up to design a pair for Canadian Living I said “Sure! Super fun challenge, I’d love to!” And then, I quietly panicked. “It’s all been done before,” I moaned to myself. So I went and got some Malabrigo (like you do, when you want something warm and cozy on your hands), and started playing around with it, and got a first version. And then I made it less complicated and knitted it again. And then I changed one or two other things and knitted it again. And then the thumb wasn’t how I wanted it to look, so I knitted it again, and you know, now that they’re done, I rather like the result. These mitts are simple enough to not require more than a week or two of off-and-on knitting (or a weekend for the speedy types), but interesting enough to keep you paying attention. There is a full thumb gusset – because I like thumb gussets – but the actual thumb itself is quite minimal which means that once you’ve cast off the palm, you’re practically done. They’re knitted in Malabrigo Silky Merino which is super soft and lofty, but because the double-moss stitch panels are done in twisted stitch, they will be a touch more snug and durable than if done in plain stockinette. And they are long enough to fit under the cuff of your sweater or jacket, which means they can keep that chill from going up your sleeve while you sit in your cold office or dash out to grab that newspaper maybe with your coat thrown over your pyjamas and clogs not that I would ever do that, though or whenever you find yourself needing a bit of insulation. And, most importantly, because they only require a single skein of that delicious, delicious Malabrigo Silky Merino, they will let you splurge on some of that luxury yarn without having to break the bank. Of course, because they’re so soft and quick, you may need to either guard yours carefully or be prepared to make more for gifts. They may be hard to take off. Also, may I say how pleased I am to be in the Canadian Living December issue, which always has whackloads of holiday recipes in it…this one, I have noticed, includes a holiday brunch menu offering recipes for not one, not two, but three different vodka/juice cocktails. Canadian Living food editors, I like your style. In case that’s not enough reading for you today, Austen, the CL crafts point-woman was nice enough to do a little blog-style interview with me, and you can find further Ramblings Of Mine over on her post from today. Enjoy, my friends! Stay tuned later, when I may just have to go off in search of extra newsstand copies for a blog giveaway. And, as always, may your Monday be as painless as possible, and may your knitting be waiting for you at home. I can’t believe I had the issue in my hand yesterday and put it back because I thought it a good idea to avoid learning new and delicious ways to ingest calories… Well, I can solve that problem next time I walk past a newstand! Congratulations Glenna on being published in CL! Those mitts look wonderful. Boy do I wish I were Canadian! (or living close enough to be able to pick up a copy of the mag!) These are awesome. Any chance that someday they’ll be available to those of us who can’t get our hands on the print magazine? Congratulations on having your design published! And in such a great publication. The mitts are beautiful; they deserve such attention! I’m also waiting to hear when they’ll be accessible south of the border. Love your mits. I am currently working on “Podster” mits. They were my first actual gusseted mits and they have been a dream to knit. Love the blog! Thank you. These are quite beautiful! And a wonderful way to work up Malabrigo – I love the stitch pattern!! Woot! Off to the store for CL! They’re beautiful, and I have ahem, rather a lot of Mmmmmmal Silky Merino in my stash already. Off to email my cos to see if she’ll buy me a copy and mail it to Virginia!!! P.S. I’m only partly kidding about the bribery…..
Congrats on getting published!! I’m going to have to look out for that issue. Congrats! My copy arrived last week but I’ve been saving it for a lengthy hospital stay in TO. Can’t wait to dive right in later this week! Oh and I love the ring you’re wearing, too. Is it amber? Colour looks great as well! I HAVE TO HAVE these! Will this be available to the rest of use before Christmas? LOVE. Great pattern. Canadian Living! What a thrill! I LOVE that colourway, you’re always giving me great projects to add to the queue. Dude! That’s awesome! I shall hie me to a news stand tomorrow and pick up a copy. Also, the mitts are very lovely. Congrats! They are nice mitts. they look fitted enough to wear at home and outside under bigger gloves. Congrats on getting this pattern published! The mitts are gorgeous… I will go buy my copy ASAP! They are the perfect gift for a friend of mine. Wow! That is so exciting! Great job. Of course I want to win a copy since I am not in Canada. Great interview, too. I love your mitts! Beautiful and great for walking the dog! I love Canadian Living (my husband’s family are all up in Edmonton so I buy it whenever we can get there)! Unfortunately I am in oregon. Are you going to offer your pattern as a download on Ravelery? I would love to win a copy if you have extra! Congratulations getting published! Oooh, very pretty, and in one of my favorite yarns! Congrats on the magazine. Found it, bought it, LOVE IT!! Thanks Glenna – can hardly wait until my LYS opens tomorrow to buy the yarn!! BTW – don’t know if you had any influence over this, but it’s great that that pic and pattern are on two sides of one page rather than facing pages- perfect to put in its own page protector in my pattern collection! Congrats, Glenna! Very exciting. I only wish I could run down to my newstand to pick up the mag, but *sigh* I’ll have to figure something else out! Congrats on being published! It’s an awesome feeling. I have a friend who lives there that I can ask to send me a copy. We lived in Oakville, Ontario many years ago. Gorgeous color, and a nice textured stitch – congrats on another publication! I love that color. I know what you mean about thinking it’s been done. But amazingly enough, new patterns and variations keep coming out, so hopefully that means the saturation point is very far off! Rock on! I remember the beginning murmers of this, project, and now look at where you my intrepid designer!?? congrats, much dancing of joy for you and many hugs . Super cute!! I’m feeling quite behind in my knitting patterns…. and really do need to make a pair of mittens for a friend! Beautiful pattern! Being from Tucson AZ, we don’t get much of a chance at seeing Canadian Living magazine so please let us know if/when the pattern becomes available! Let’s see, what do I like to knit in the winter…even though it’s the desert, it still gets pretty darned cold so I love quick knit projects such as mitts, hats, and neckwarmers. Just finished 2 neckwarmers and working on a hat for Christmas gifts! I love the mits. And the yarn… beautiful! I forgot to leave my location in my last message! I’m in Washington state. USA. I’m a relatively new knitter, and passionate about knitting warm sweaters right now! Especially the ones that end up fitting! I’d love to get my hands on a copy of deliciousness! I guess around this time I don’t really have a favorite thing to knit. It’s mostly just working on Xmas presents and trying to be prepared for the 4 million family obligations that accompany the season. I absolutely love these mitts, and as luck would have it I (a) don’t know anyone who can get me the magazine (I live in Maryland), and (2) my favorite winter thing to knit are fingerless gloves! But yours are the prettiest I’ve ever seen. Please, please, please pick me! I’m from Colorado and would LOVE to have a copy of that issue. My favorite thing to knit in the winter–fingerless mitts with a matching hat. You are so thoughtful to do this! Not in Canada here (in UK – that too far?) but loving the pattern! I like knitting fingerless mitts, too – and hats – but have yet to do textured mitts. That’d be new! I’m in North Carolina, USA and I love to knit winter hats. I have a five yo so I love making him silly winter hats! Ooooh I’m not a Canadian – I’m English but living up in Perthshire, Scotland – so I would just love my name to go into the hat please Glenna 😉 Such lovely, lovely mitts – I have always wanted to try Malabrigo too – and I must say it sounds a really nice magazine!! My favourite thing to knit in winter is toasty warm socks (love those in your latest post) or a snuggly hoodie (which I am doing at the moment in some Noro Kochoran). But I have just discovered the pleasure of mittens. Laurie from Minneapolis, Minnesota — have already commented, but want to be sure I’m on the list. You’d think being such close neighbors we could get that mag here, but nooooooooo…. As a newbie knitter, I’m still finding the stuff that calls to me, but of the winter projects I’ve knitted (*are* there other types of projects? Really? ), I’d have to say the mittens I just finished were my favorite. Easier to knit than I thought they would be — of course, they are just BASIC mittens, but still — and best of all, they FIT! I’ll be winding up the other skein of yarn I got for them (wasn’t sure if one would be enough) so that I can knit one more so that maybe the set looks more like siblings than kissing cousins. (Damn Noro colorways — love them, but they do some odd things sometimes.) I’m also considering knitting a few up for the mitten/hat/scarf drive that my credit union does. They were really pretty quick. I am so excited about the chance to win this! Once again, your genius shines with those gorgeous mitts! hmmm, a magazine with shortbread recipes, vodka/juice cocktails (oh you are so singing my tune!) and and and. I might just need to get me a subscription! Winter knitting… after the holiday knitting… just about anything for myself, sweaters, socks, vests…. These look wonderful! I would love to win this pattern! My favorite winter knits are sweaters, scarves and mittens. I’m currently making a pair of podsters for my dad! 🙂 thanks! Ohhh. I’d love a copy! I live in the Washington DC area and my favorite thing to knit in the winter? Sigh. So many things. Probably socks! PS…. you know I don’t live in Canada… and I forgot to write how beautiful your amber ring is. GORgeous. Glenna AHHHHHHH!!!!!!!. I love these!!!!! I’ve been looking for something just like this that didn’t have all the cables etc. They are just beautiful. Sadly I don’t know anyone in Canada to get a copy from. Oh well, I am sure the pattern will come around one of these days!! I love to knit sweaters, wrist warmers (it’s true!) and cowls for winter. Oh, and socks. But that’s a given. How pretty! I’m in South Florida, but have a tendency to always feel cold, especially indoors! We even use our fireplace so that we can pretend it’s winter. Just discovered your blog! Great job! Love the pattern in those mitts! My favorite thing to knit for winter here in the Los Angeles area … that’s hard… mitts, sweaters, blankets. Well I’m going to go with mitts because they are quick! lovely mittens and congratulations on having the pattern published! You really should be proud of youself and your knitting abilities! I`m living Frankfurt, Germany and would of course LOVE to win a copy of Canadian Living, which you can hardly get here. My favourite things to knit for winter are scarves, shawls and everything cozy to wrap yourself in. Beautiful mitts! I’m from southwest Ohio and I like to knit all things winter. I don’t seem to be able to get into summer knitting – maybe because summer is so short and winter is so long! If I had to pick one winter thing as my favorite knitting, it would be a pair of toasty wool socks. Wow I love the mitts would be great to be able to knit then in England! okay, commenting again — i’m from new york state, currently i’m addicting to knitting hats out of handspun (!!!! ), and i would LOVE to win a copy of this magazine! I’m really wan to knit myself a pair of mittens out of some of my handspun this winter. I’m just having issues choosing a pattern. There’s just too many to choose from so I’ll probably end up making a franken-mitt (tee-hee). From Oklahoma City, Oklahoma – I just love to sit down a knit up a couple of afghans in the winter. In fact, I’ve even gotten my husband bit by the knitting bug. We curl up with a good movie, a fire in the fireplace, and both knit away on awesome blankets! Socks. I’ve done mittens, hats, scarves, but my favorite is socks. Congrats on another published pattern! I’m quickly becoming obsessed with yarn and love your blog. I love to knit mittens!!! I live in St. Louis, MO and would be honored to receive a copy of your pattern. I’m an American, currently living in St. Louis, Missouri. I was born and raised in upstate New York, near Rochester and so I remember all those cold winters. I have only been seriously knitting about 18 months and my favorite thing to knit right now is lace shawls – I am working on Swallowtail in Sea Silk. Good for winter here since St. Louis isn’t really cold. BUT for the last week, I have been looking at mitten and mitt patterns on Ravelry – they would be portable and use up some of my sock yarn(and my daughter goes to college in Minnesota so they would be useful). I’m not Canadian! I had already commented but didn’t leave the info you request. I’m from Southern California and my favorite things to knit in winter are sweaters. Thanks for the opportunity to win! Hiya from Kensington CA (SF Bay Area)! My favorite thing to knit for winter is in a constant state of flux — most recently completed: Leafy Mitts from Impulse of Delight (Ruth Stewart) for a friend’s birthday. Thanks for doing this! I am from Illinois! I love to keep warm so I love hats! They are so east to make but so darn cute, too. From Austin, TX here… Fav winter item – sweaters!! It gets barely cold enough in January/February for us to to even think about wearing long sleeve woolen items. PS – I just started Autumn Rose! I didn’t even know it existed until you posted pics of yours. Thank you for the inspiration!!! Your Autumn Rose came out so beautiful!!!! Also, your notes rock. Especially the drawing your own schematic part. I do believe you saved me tears and heartache. Thanks a million!! Yay! I’m from the Bronx (New York, that is). I’m knitting up a whole bunch of fingerless mitts right now, which I love for portability and swiftness to completion (gotta love the instant gratification patterns! ), and some scarves (not so swift, but still good train knitting). After the holiday knitting is done, though, I’m knitting myself a sweater! Garsh, I love those mitts. Did I mention that you have gorgeous hands? And I’m not just saying that because I’d love to win that kit. It’s true! Whoops, forgot to add that I’m from Colorado in the US, where fingerless mitts are the perfect knitwear for our sunny but snowy winters. But what I lovve to knit in the winter is hats. And this year it will be Felicity hats, like no one’s business. I’m in Wisconsin, so I’m all about the warm mittens and hats in the winter. Oddly, I’ve only ever knit myself one scarf and I wear it all the time no matter whether it matches the coat and other knitwear, so I think I’ll try to make at least one more scarf for myself this year. reposting from Baltimore, MD USA baby! I’d love to win that magazine and your wonderful mitts pattern. My fave winter knit has usually been something semi-mindless as I settle under the warmth of a blanket or comforter. It’s been afghans in the past but this year I think will be the Rogue hoodie. I’ve had all the supplies for months, just no time to do. Getting other UFOs and WIPs off the needles in the mean time. . . .
Great mitts. I would love to win a copy of the magazine. While we don’t have such cold winters, my California blood is really cold so I do knit warm things. Hi Glenna! I am from Iowa and my favorite thing to knit for winter is sweaters. I am always so inspired by the sweaters you knit, I plan on making Cassidy next. I am writing you from Oregon. My favorite things to knit anytime of year are socks, but I also enjoy knitting mittens or fingerless mittens (or gloves!) during the cold weather seasons. I just realized I enjoy knitting for my hands and feet. I guess if I have those things covered then I am good to go. I’m from Indiana (US) and I knit all kinds of things in the winter, but my favorite winter (and spring, summer and autumn) knit has to be socks! Wonderful woolly socks! I’d love to have a copy of that magazine. Your mitts are awesome! Hi Glenna – I’m from Kalamazoo, MI and my favorite winter knit is hats. Although now that I’ve been reading your blog for the past few months I think I may be tackling lots of sweaters this winter! Thanks for the chance to win a copy of the magazine. My favorite winter thing is wrist warmers and fingerless mitts. Really! I’m wearing a pair of Mrs. Beeton right now. We like to keep our house on the cool side, and so fingerless mitts are a perfect warming accessory! Hi Glenna — I am in north central Ohio, on the balmy southern shore of Lake Erie! I love knitting little wintry things such as socks, slippers, mittens, gloves, hats, cowls and scarves. I love them all too much to choose. My mother was a Hamiltonian so I can beseech my cousins in the (likely) event the odds are against me! I would love to win a copy of Canadian Living! I’m in northern New Jersey. The mitts look great; I’ve recently been knitting a bunch of fingerless mitts and really enjoy knitting them. I guess my favorite thing to knit in winter so far is shawls and fingerless mitts. I’ve seen some pretty stranded mitten patterns on Ravelry and may try knitting a pair of them. Congratulations on getting your pattern published in the magazine. Beautiful mitts. Love the colour. Congratulation on the publication. Those are fabulous mittens! Here in California it doesn’t get that cold so my favorite thing to knit are socks. Love the glove pattern. What great textures! I’m in Ann Arbor, Michigan. I’m all about the hats and scarves and sweaters during the winter, and just finished my first Fair Isle hat. Congrats on all your recent design acceptances. You do beautiful work and have a great sense of humor on the blog. Love the mitts, especially because they are purple. My hands get cold in Kansas probably because I have to be at 7 AM. 7AM. What an ungodly hour. Love the mitts. I’m in Ohio. Would love a copy. Since I live in NC, the winter weather here isn’t nearly as cold as it is in other places, but I do like to have at least one fairly large project going during the winter months. Either a sweater for dh or an afghan…..just something that takes up plenty of lap space and keeps me warm while I work on it! LOL! Would like to knit a cream aran wool sweater for myself soon, but sweaters take so long! Hi, I like to knit Christmas gifts as soon as I can :p. I usually knit things like hats and scarves. It’s odd but in a reversal I usually knit more during the summer. I have circulation issues and having my hands bare anywhere during the winter (even inside) can be difficult. This doesn’t stop me from knitting though :). My favorite winter knitting is probably hats. I’ve got a zillion of them and another one planned (of course). Oh, shortbread recipes and knitting pattern…can’t beat the combination! Oh, and I forgot to say that favorite winter knitting is definitely sweaters! Hi, Rachel from Kingston, Ontario, Canada. I LOVE LOVE LOVE making mittens. Thrummed mittens, Stranded mittens, Poetry mittens, I just can’t get enough! 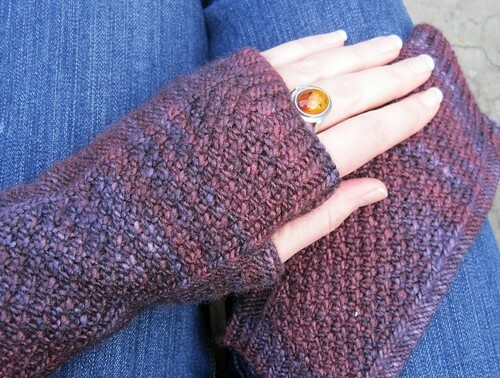 The fingerless mitts/gauntlets above are GORGEOUS! congrats on getting published. very pretty pattern. i knitted my first fingerless gloves last spring – nothing as fancy but it was fun. Since I live in California I knit mostly socks and occasionally mitts. Mitts are perfect for offices where colleagues seem to prefer arctic temperatures. I realize “arctic” in California probably has a different meaning than it might in Canada. It’s all relative. To me 65 is arctic. In any event I love the mitts and have never even seen an issue of Canadian Living and would love the pattern. Glenna – I’m from Pittsburgh Pa and would love a copy of the magazine. My favorite winter knits are sweaters for my girls and grandchildren. I currently have your Podsters OTN. I could use a new recipe for shortbread for Scottish Sunday. Thanks. I’m here in New Jersey USA, where the winters are not nearly so cold as up in the frozen north, but chilly enough to require warm woolies. I’ve only been knitting for one winter so far, and last winter I made a lot of hats. So far, I’m working on mittens and fingerless gloves this winter, so your pattern would fit right in! I live in Washington about 20 minutes away from Canada. It’s very cold here so my favorite thing to knit would be accessories including hats, gloves and scarves to keep me warm when it is chilly. I’m definetly a hat person so that would be my number one, second only to GLOVES!!! What a great contest and great for us who can’t get that magazine! I almost commented yesterday anyway on such pretty mitts and it’s neat because mitts are my favorite thing to knit for winter. Yes, yes, we do wear them for several days during each of the winter months here in Tallahassee . . . . especially people who know me and have received them as gifts during the past 2 years. Love your blog AND your knitting! Hi from the Blue Mountians, Australia! In winter (and yes, it does get chilly in the mountains) I mostly knit jumpers for my three girls and fingerless gloves and socks for myself. Your mitts look particularly lovely! Hello from Spokane, WA, USA! I have mostly been doing charity knitting for the troops and an orphanage in Canada. However, I just finished a shawl for my mother-in-law for Christmas and 7 pairs of mittens for a teen center here in Spokane. I would love to get a copy of the magazine! Well a lot more folks have stopped by since I left a comment before, wow! I figured I’d come back by and answer your questions in your Note from the Future! I’m originally from outside of Boston, Massachusetts, where we get some nasty winters. My favorite winter thing to knit is probably socks. I just love socks in general, and it’s something I know I will actually finish, even though I love sweaters too, and although I wish I could wear them in summer, it’s still a habit mainly reserved for fall and winter wear. Hi from Paris, France. I really like those mitaines. They are more practical here since it really doesn’t get as cold as it does in Canada and we’re in and out of the métro so gloves and mittens are put on, taken off and get lost whereas a mitaine can stay on. I’ve never knitted gloves or mittens yet. My favourite thing to knit for the winter is cowls. Again the on and off thing with public transport and I cycle alot so it’s more practical than a scarf. I love your mitts, and I’d love a copy of the magazine. Every winter I have a new favorite thing to knit — this year it’s mittens for lots of nieces, nephews, and other small people. I really do love those mitts that you made. Love how they snug up your hands quite lovely. I also love those “Yellow Brick Road” socks from the next post! I am from Fort Wayne, IN and my favorite things to knit in the winter are socks. I love socks. Last year I knit my daughter a pair of really nice toe socks with multi-colored yarn from the top down and then each toe was a different solid color. She loves them! Commenting from all the way down in Kentucky, USA! Those are great mitts – I’ve been wanting to knit fingerless mitts for ages but just haven’t gotten around to it. I actually don’t knit very many winter accessories – I tend to knit mostly sweaters and lace shawls. However, I’ve recently discovered triangular shawls wrapped around the neck are great for keeping the draft out of the gap produced by the neckline of my coat! I live in Glendale, Arizona. I’ve only been knitting for a few months but have become truly obsessed. I don’t really have a favorite thing to knit yet. But I’ve really enjoyed a couple of sweaters that I’ve done. I’ve finally tried a project on dpns that was a lot of fun too. I think my next project will be my first attempt at socks or mittens. I’d love to have my name in the drawing for the December 2009 Canadian Living! Hi! I’m not sure where I stumbled upon you blog. But I’ve been reading you for about 2 weeks. I live in Wisconsin and actually visited Canada once 5 years ago for my honeymoon. 🙂 I would LOVE a copy of Canadian Living! I have only been knitting for about a year – but I have learned that I love to knit socks. I CAN knit other items, but socks are the most fun. It’s fingerless mitts for me this year … very useful along the Front Range of Colorado, USA. I love that mitt pattern, so I can’t wait for the results of your drawing. My office is cold enough that I wear them when I type at the computer. The mitts are beautiful! I always have freezing hands, so it’s nice to stay warm and dexterous at the same time. I’d love to win the pattern. I’m from Portland, OR, and I’m a sucker for sweaters. In the winter, I like to make some small accessories too, but my heart lies with sweaters. I’m from Cedar Rapids, Iowa, USA. Nice cold winter weather, perfect for handknits! First I want to congratulate you! I just started getting two of the Canadian Living’s Newsletters and love them! (I get the Green Living and the Craft’s one) I would love to get a real live copy. Thank you for offering this. I’m from Ellensburg, WA, but I’m studying in New Orleans, LA, right now, where it does in fact get cold during winter. Although “cold” here is about sixty F. Sometimes it gets down to fifty. Last year we had snow for the first time since 2004. I did scarves all last winter, but I just got into socks. Those are cute! I’m not in Canada – but awfully close. I’m in Minnesota. 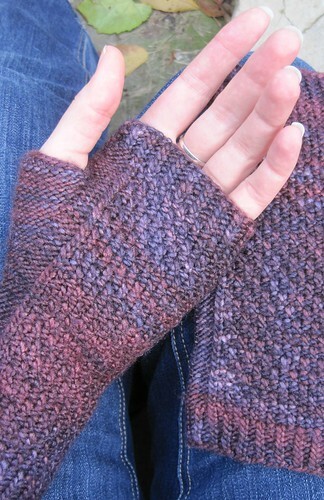 Just finished a pair of ‘blogging gloves.’ Technically – not fingerless because only the tips are missing. They work for blogging in a cold office! Have a great day. Your mitts are wonderful! The yarn looks yummy. I live in Massachusetts. For the winter I like to knit socks. There is nothing better than finishing a pair and popping them right on. and although we only get a few weeks (sometimes days) of cold weather I still enjoy knitting wooly things. I usually choose lacy wraps since they work well for chilly nights and air conditioning but I recently made some mitts for wearing at work. Yours, however, just beat the daylights out of mine. I love the mitts! Can’t wait to try them if I ever finish my Viper Pilots. I live in Brooklyn , which actually has winters that we didn’t have in the South, so I’m still working on winter knits, but right now I’m really loving slouchy hats, for some reason. Congratulations to you from Phoenix, Arizona. The pattern is gorgeous and fingerless mitts is not something I’ve yet done, although I’ve had requests from the youngest daughter. My favorite things to knit are probably capelets and scarves and shrugs. We don’t need many cold weather garments here so I do a lot of knitting as gifts for family and friends in cold areas. Great Job. I am in Albany, New York. I like to knit sweaters. Those are beautiful! I was actually thinking about knitting a pair of mitts for a friend for Christmas, and that pattern would be perfect! I am from Chicago, so all things soft and warm are good here. My favorite things to knit are socks, although I’m such a slow knitter I average about one pair a year. Mostly I knit hats and scarves–I’ve kinda got Knitting ADD and big projects like sweaters can’t hold my interest. We have to factor in my capabilities here, so I’d have to say hats, since I haven’t dared try socks yet. Although we wear hats in North Carolina, I send most of them to the grandsons in Indiana. I do want to try the fingerless mitts though. :)They’re perfect for my photographer daughter! Thanks for a chance to win, I live in seattle, wa and my favorite thing to knit is socks and baby hats or anything for my 3 little girls! Thanks! Loving the mitts! I’m in Saint Louis, and am eager to try a new pattern. Right now, working on too many afghans and of course, winter hats for my DH and DS, who is 1 yo! Oh, those are lovely! I’m in southwest Virginia and my favorite wintertime knit is a big soft and snuggly shawl! Nice mitts! I’m currently in PA and I love to knit sweaters, or mittens, or shawls, or really anything. I love knitting during this time of year. Very pretty! I’m in the Boston, MA, area. Tho’ I’ve never really thought about my favorite thing to knit for winter, just about every December I find myself casting on a sweater…. I actually love to make mittens, but this “winter” (meaning as soon as I can finish Xmas presents) I hope to do your mitts such as yours as I am sure even if I don’t “win” your contest that somehow you’ll find a way to get the pattern up on Ravelry. I live in Central California, where winter is means rain (awful, but we need the water) but we also try and spend as much time as we can in the Sierra — where mittens are always warmer than gloves! I’m in Germany and this winter I have a need to make plenty of hats!! 😀 Poor little ears are suffering from the cold. Hi and please enter my name for the free drawing. I live in Massachsetts, my favorite thigs to knit in winter are scarf and fingerless mitt sets!!! I am from Monroe, NC, USA. I love to knit hats and gloves, mitts, and fingerless things for my family to keep warm during the winter. And always have a sock project or three going to fill in any other time. I would love to knit you mitts. Thanks for the opportunity. The mitts are lovely- the pattern makes me want to spluge on that beautiful yarn right this moment. I just moved to Delaware from central PA, and I knit socks (love them). All of my family are in cold climes so I end up knitting a bunch of worsted weight socks all winter. Quick, easy and a family pleasure. What’s not to love? I would love to win a copy of your great pattern! I am from Alexandria, VA and my favorite thing to knit in the winter is hats for my family members. Considering my dog ate my husband’s Habitat I made last winter, I guess I had better get started! Wow, these are great. I’d love a copy of the pattern. I’m in Pittsburgh, PA and my favorite things to knit in the winter are mitts, hats, and dog sweaters. I love your mitts, would love to make them. My favorite knit project would be anything that I finish! Love to plan and start projects. I’ve had to make promises to work on older starts first before I move on to other things. I live in northeast Ohio and even though the weather has been lovely this week things are about to change. I have the same problem with starting warm woolies when I suddenly need them. Here in Denver, Colorado we had an early surprisingly substantial snowstorm almost a month ago (at least 18 inches where I live) so, as always, I started some slipper socks because my toes were cold. However, we have also had a reprieve although snow is possible this weekend so I may actually have the socks for the next blast of winter. I love your fingerless mitts and would love a holiday issue of Canadian Living (I’ve found lovely things on their website whilst browsing about). And I have some Malabrigo silky just waiting for the right project! My favorite winter knitting is much like yours — warm accessories. Hats are probably my favorite, I love scarves but don’t really love knitting them but I’m going to try and make a few to liven up my rather drab wardrobe and mittens, cowls and the like. I’m working on my first pair of gloves and have found knitting the fingers to be satisfying — objectively they may take longer than mittens but they feel faster because each finger goes so quickly. And I’m excited to finally have a pair that actually fit my stubby yet large fingers. Congratulations on the published pattern. I live near Pittsburgh Pennsylvania and I would love to win a copy of the magazine! My favorite winter knitting is usually scarves, but I am going to try some fingerless mitts this year. Congratulations on your published pattern. I would love to win a copy of Canadian Living. I live in the San Francisco Bay area and my favorite winter knits are hats and scarves. If I don’t win the magazine, how will I be able to get a copy of your mitt pattern? It is beautiful. Many thanks for doing this. Keep up your beautiful work. Hi! Love the mitts! I’m always trying to find a pair that seems very fluid so I can wear them when I paint (that’s what I do for a living down here in Connecticut). My favorite things to knit in the winter are socks and mittens – I just finished the most gorgeous pair of fair isle mittens a la Alice Starmore – but I have bigger projects in mind for this winter. When in doubt, I always knit a hat. I’m working on a couple of hats for my niece and nephew in North Carolina. I find that hats are the easiest for me to do by the seat of my pants, which I like. Plus, you only have to make one…no SSS issues! I’m considering this my “entry” for the contest, but do let us know if you offer the pattern for sale later. Beautiful pattern, stitch, and yarn…congrats on being published in Canadian Living! I’m crossing my fingers that I am the lucky winner! My favorite thing to knit for winter is thrumbed mittens for all the little people in my life…they are toasty warm for New England winters! 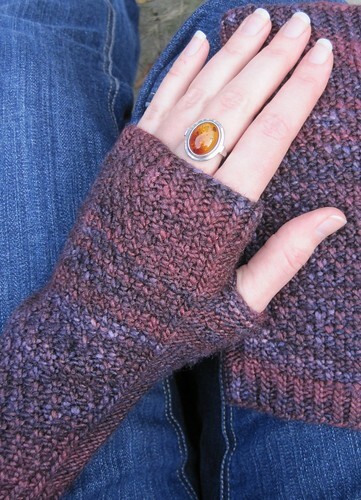 I would love to knit your fingerless mitts for the “big kids” …they’re truly beautiful! Thank you for your generosity…I’m very grateful! I’m a Californian from the bay area, living in SOUTH KOREA! I like to read your blog in the mornings with my first cup of coffee. I loved your mittens and the yarn which especially looked great against the denim. I decided to learn to knit since moving here and have learned it all in Korean. I like to knit my son sweaters and scarves for the cold Korean winters! I would be ever so grateful to receive a copy of the magazine. Thank you for the great inspiration your blog and designs provide! I live in Albuquerque New Mexico so nowhere near Canada- would like to visit (in the summer perhaps?). I just finished my last scarf/neckwarmer for co-workers (total of 16) and am now working on a pair of socks- for me. Socks are probably my favorite go-to item, but I really like the look of the mitts and my hands are always on the cold side…. I am sorry to hear that you have had difficulty with the pattern. As is often the case with pattern instructions, there are many possible ways of writing instructions and it is difficult to make each step clear in exactly the same way to all knitters who will work on it. I am glad to see that you have noticed the update on the Canadian Living crafts blog. This update was more of a clarification of an instruction rather than a correction – it involved clarification of an instruction which might have been interpreted differently. I can assure you that the pattern was knitted by both myself and the Canadian Living crafts editor before the publication went to print – even still, it is impossible to account for all potential challenges that every knitter will face when working a particular pattern. I frequently provide pattern support via email for my patterns. If there is a specific part of the instructions which you are having difficulty with, please feel free to let me know and I would certainly be happy to assist you if I can. It is only through constructive feedback that we can make improvements. This is getting a bit much more subjective, but I very much like the Zune Marketplace. The interface is colorful, has much more flair, plus some cool features like ‘Mixview’ that let you quickly see related albums, songs, or other users related to what you are listening to. Hitting one of those will target that item, and another group of “neighbors” will come into view, allowing you to navigate approximately exploring by similar artists, songs, or users. Speaking of users, the Zune “Social” is also very exciting, allowing you to find others with shared tastes and achieving friends together. After this you can listen to a playlist created based on an amalgamation of what all your friends are hearing, also is enjoyable. Those concerned with privacy will be relieved to understand you are able to prevent the public from seeing your individual listening habits should you so choose.